Maroondah Air Services heating and cooling specialist in Ferntree Gully offers installation, servicing and maintenance for all residential and commercial heating / cooling needs. Drawing on over 20 years of focused and innovative air conditioning repair and maintenance services the skilled and personalised team at Maroondah Air Services can assist you with your needs and requirements to ensure that your heating and cooling systems operate without interruption. Our unique and comprehensive ducted heating repairs ensure that Ferntree Gully home and business owners can breathe easy with our long-lasting repair options. To discover more about how our attentive and in-depth approach can provide you with superior ducted heating repairs Melbournians from Ferntree Gully to Glen Waverley can call our professional and knowledgeable team today. 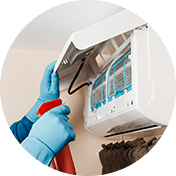 In addition to ducted heating repairs, we also provide gas cooking appliances, hydronic heating, split systems and more, from leading brands like Lennox, Mitsubishi Electric and Vulcan.